Look to the east from Chatham or Marye’s Heights and you’ll see it. No, not the Phillips House itself, but rather the huge radio tower that rises next to the site of the house, visible from miles around. It is, I think, the only time and place we take advantage of (rather than lament) the presence of a 500-foot tower. We point it out probably a thousand times a year. “Mulberry Hill” was the home of wealthy merchant Alexander K. Phillips. During the war it became world-famous as the “Phillips House.”Completed on the eve of the Civil War, this was one of the most fashionable homes in the Fredericksburg region. Its high style befit its wartime owner, Phillips, a diverse entrepreneur who served on town council and owned a brew house, warehouse, three wharves, and a lumber yard in Fredericksburg. 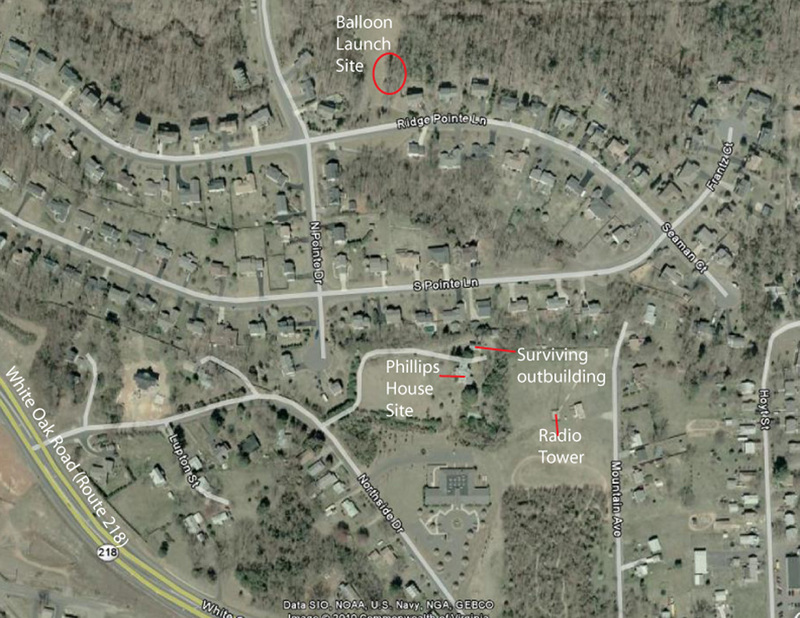 Phillips purchased the land at “Mulberry Hill” in 1855, though he lived in his mother’s residence on Caroline Street in Fredericksburg. In 1860, Phillips, 56, lived with Anna Phillips, 28, his daughter, and his mother, Margaret, 82. 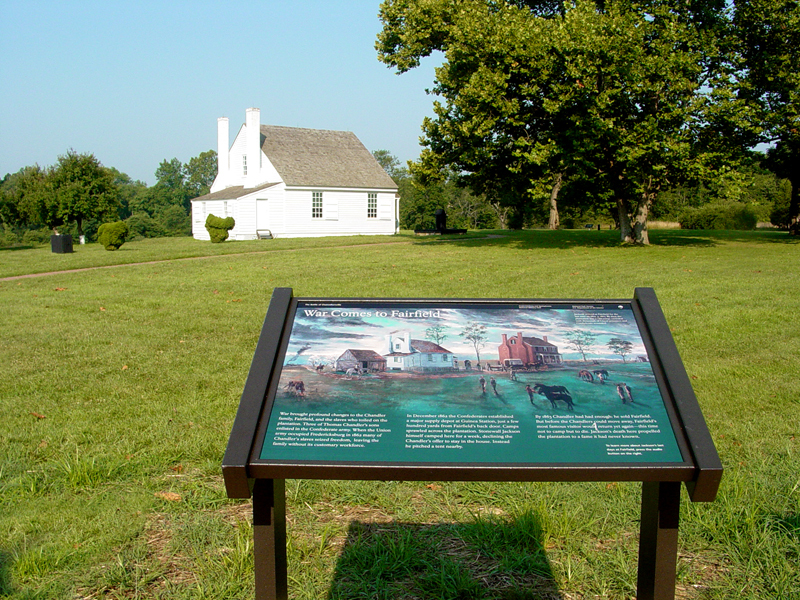 Phillips kept twelve slaves at Mullberry Hill, working its 550 acres. The Phillips House reflected one of the stylistic rages of the time—Gothic architecture with some features of an Italian villa. Among other niceties, it featured running water—supplied from a tank in the attic. A reporter for the Philadelphia Sunday Dispatch described the Phillips House in January 1863, just weeks before its destruction. 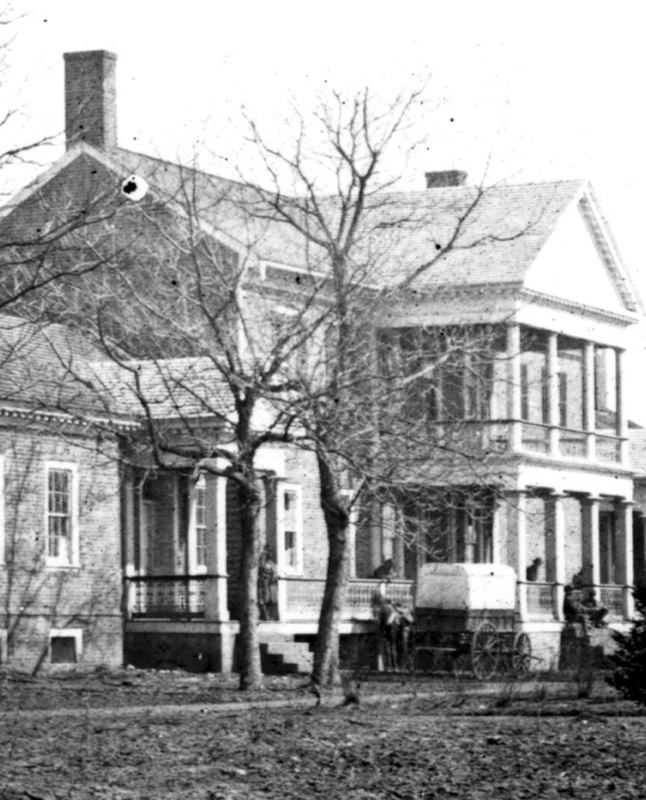 The only known image of the Phillips House before its destruction in February 1863. 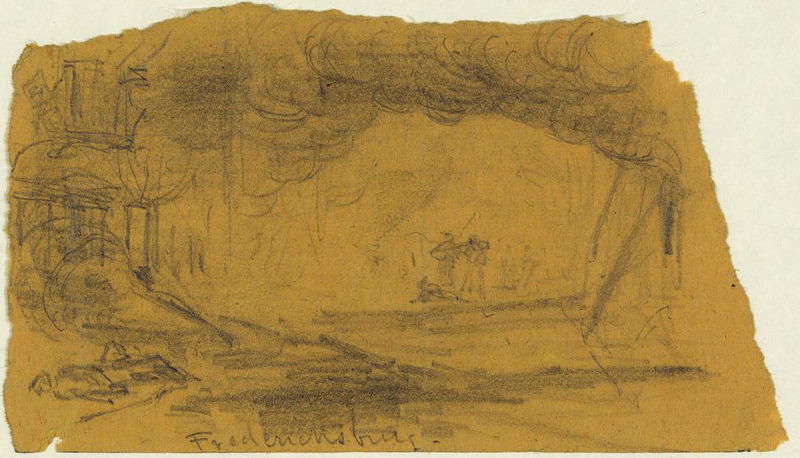 The specific date and location within Fredericksburg are not identified by the online catalog for the Library of Congress, where the sketch resides. Erik F. Nelson, a senior planner with the City of Fredericksburg, has observed that the heavy smoke suggests a moment early in the Federals’ December occupation and shortly after the cessation of their bombardment: sometime in the late afternoon or evening on December 11. This night the city was in the wildest confusion sacked by the union troops = houses burned down furniture scattered in the streets = men pillaging in all directions – a fit scene for the French revolution and a discrace to the Union Arms – This is my view of what I saw. We are rapidly moving toward a world where fixed, structural onsite interpretation (like the wayside exhibit at Jackson Shrine, above) will be obsolete. Someday not far off, visitors will come armed with wireless devices–think not cellphones and Blackberries, but I-Pad and its successors–that will deliver film, maps, audio, animation, and other nifty things that will make current wayside exhibits seem like 1950s TV (quaint and nostalgic, but clearly out of date). This is not a bad thing. In fact, we ought to look forward to the possibilities of more dynamic presentation of media. Our visitors deserve it. Thanks to Kevin Levin over at Civil War Memory for his very kind end-of-year kudos for Mysteries and Conundrums. We thank all of you too for reading. We have had great fun doing this, and look forward to year #2. 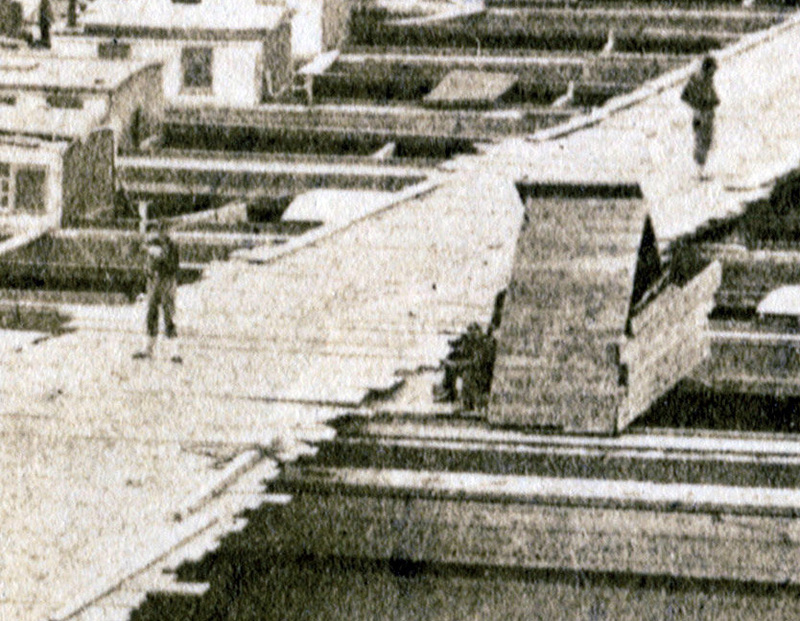 In our prior post on the 1862 image of the canal boat bridge we focused on the group of African-Americans in the foreground of the image. In this installment, we’ll take a look at the rest of the image–a trove of details innumerable. As we mentioned earlier, the canal boat bridge at Fredericksburg was one of four constructed by the Union army in the spring and summer 1862–construction made necessary by the Confederates’ destruction of the bridges when they (the Confederates) abandoned Fredericksburg on April 18, 1862. 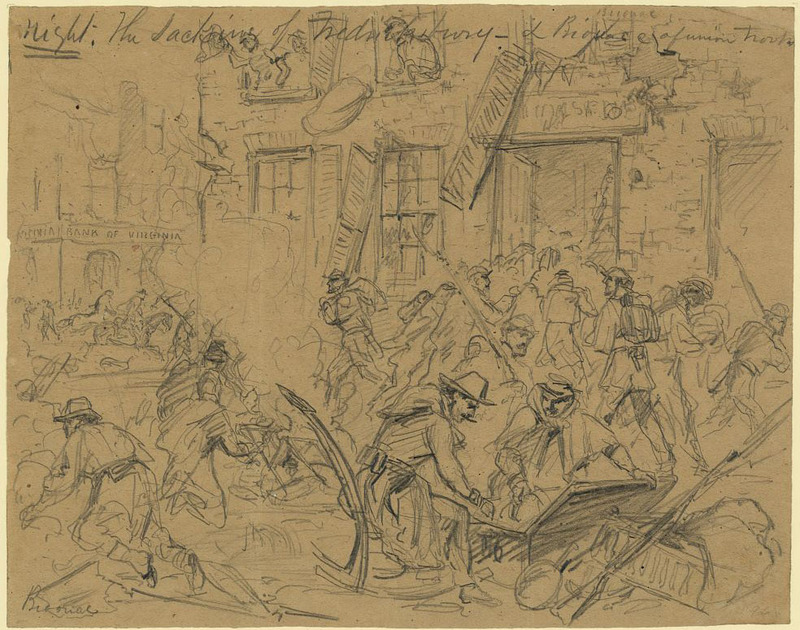 For more than a week after the burning, the Union army did not enter Fredericksburg en-masse–a fact that inspired some quiet taunting by the locals. 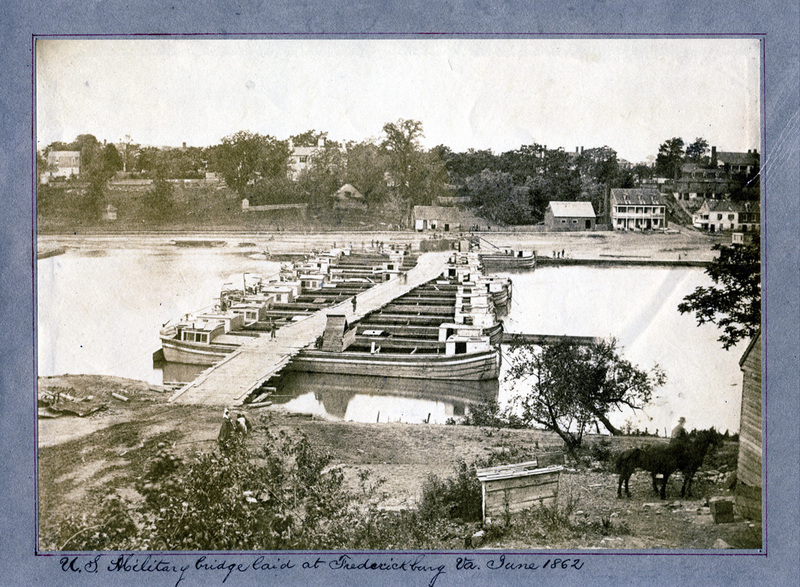 On April 25, steamboats chugged up to the wharf with as many as 20 canal boats in tow, and that day Union engineers started building the first bridge across the Rappahannock. The bridgebuilders were protected by a pair of Union howitzers likely placed on Ferry Farm, overlooking the bridge. Betty Herndon Maury recorded that as the bridge went into place, soldiers bantered loudly with African-Americans who had come to the town dock to watch the work. The bridge built on canal boats was completed on May 1. Of the four bridges (a pontoon bridge would be completed below Chatham on May 2, the railroad bridge about May 9, and a bridge on the old abutments of the Chatham bridge sometime thereafter), the canal boat bridge was intended to carry the heavy wheeled and horse-borne traffic. That Mayday afternoon, May 1, Union generals Rufus King and Marsena Patrick led a contingent of cavalry across the new bridge into town. Two days later, Secretary of War Edwin Stanton and Secretary of the Treasury Salmon Chase crossed the bridge for the first visit of Union politicos to Fredericksburg. The four-month occupation of the town had begun. So far as we know, the bridge would remain in place throughout the occupation, with the exception of a week or so in June when it was carried away by high water. Abraham Lincoln crossed the bridge on May 23 during his tour of Fredericksburg (which you can read about here). This image of the bridge was taken, according to its label, in June 1862. We can likely narrow that time-frame to sometime after June 12 (or so), for the bridge as washed away on June 4 and took more than a week to re-gather and reconstruct. It’s virtually certain that this image is of the second iteration of the canal boat bridge. In the image are many details that hint at the everyday work of occupation and the nature of the town in 1862. At both ends of the bridge are facilities to house the guards that regulated passage over the bridge. 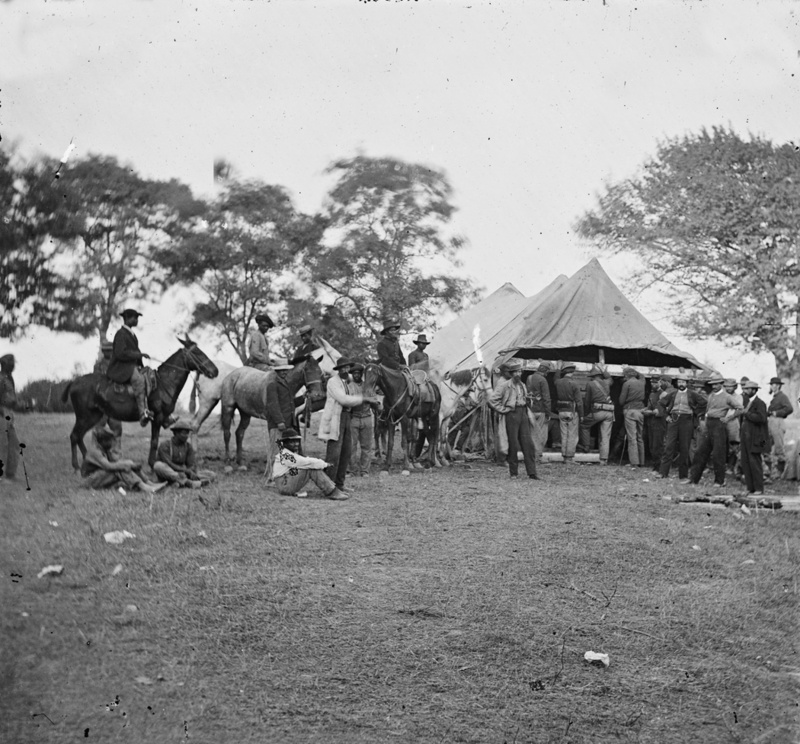 A the near end is a rude, triangular guard shack, a couple of soldiers peering from it toward the camera, with another, leggings in place, also aware of the photographer at work. At the foot of a tree, immediately in front, a heap of feet, legs, arms, and human fragments, cut, bloody, black and blue, swelled and sickening–in the garden near, a row of graves. By then, Chatham’s catalpas were probably 40 years old. Today, they are famous, old and gnarled. Their decrepitness conveys a sense of nobility. (If only it were so with people).